A range of practitioners and representatives in the manufacture of medicines, intergovernmental officials, academics and civil society representatives last week gave diverse views on the effectiveness of a waiver to international trade rules intended to ease shipments of affordable medicines to low-income countries. Alongside the first day of the 8-9 November World Trade Organization Council for Trade-Related Aspects of Intellectual Property Rights (TRIPS), the intergovernmental South Centre held a side event to discuss experiences in the implementation and the effective functioning of the system. The Declaration on the TRIPS Agreement and Public Health was adopted at the 2001 WTO Ministerial meeting in Doha, Qatar. In 2003 an agreement was reached on a temporary waiver. TRIPS Article 31 sets out provisions for when a compulsory licence can be invoked by the state. Art. 31(f) stipulates that a compulsory licence can be invoked predominantly for the supply of the domestic market of the member state. A waiver to the obligations of an exporting member under Art. 31(f) was agreed by the WTO General Council on 30 August 2003, with respect to the grant by it of a compulsory licence and export to an eligible importing WTO member(s) under certain terms. The TRIPS Council reviews the paragraph 6 system each year and reports to the WTO General Council on how the system has been implemented and used. “The system is of narrow application and also needs to go hand in hand with other policy dimensions” such as for example procurement, licensing, pricing, tariffs and test data protection he said. Kampf also highlighted that the Doha Declaration was the first time trade, not health ministers, recognised the gravity of public health issues and placed TRIPS into the wider national and international contexts. In his view, what is needed is a holistic approach and not just the narrow vision of one particular element. The key to understanding the functioning of the system is that it is about “addressing a health problem in a WTO importing member and addressing a legal problem in the exporting member,” said Kampf. Kampf pointed out that model notifications for acceptances and guidelines on how facilitate the use of the system are available on the WTO website. In light of the different situation today, where there are more medicines on the market, patents in place and potential exporters, the scope for practical application of the paragraph 6 system is wider, Kampf said, also advancing an intensified constructive discussion in the TRIPS Council on how to make effective use of the system. Kampf presented issues for consideration such as: how to use the system as a practical procurement tool; getting ministries of health and procurement agencies more actively in the process; making better use of patent, regulatory and pricing information; and how to make participation economically viable for generic drug companies. Additionally, Kampf encouraged countries to make notifications of anticipated needs under the system – even if the system is not used until the end. Paragraph 6: “Expeditious”, “Cumbersome”, or “TRIPS-plus-plus”? The fact that so far in 13 years there has been one case of use of the TRIPS waiver was discussed by panellists. Yuanqiong Hu, legal and policy advisor at Médecins Sans Frontières (MSF, Doctors without Borders), shared the experience of MSF and its Access Campaign, which has been working on the issue of access to medicines since 1999. Hu said access is a continuing challenge and that the price of drugs is rising in all countries. Moreover, Hu pointed out that the research and development framework does not meet the needs in the field and overall that MSF works in resource limited settings. In response, generic competition has proved to be a catalyst to dramatically drive down prices and contribute to the scale-up of ARV treatments, she said. Along with providing a detailed outline of the one case where Canada exported antiretrovirals (ARVs) to Rwanda, where MSF was also involved in promoting the implementation of paragraph 6 provisions into Canadian legislation, Hu described how MSF began procurement procedures from Hetero, an Indian generic pharmaceutical. Procurement was made under the WHO’s prequalification programme in 2006. Dean Foster, deputy director of Global Affairs, government of Canada, articulated that “there were a certain amount of growing pains and lessons to be learnt through being the first and only test case under the paragraph 6 system,” given how complex intellectual property and regulatory matters can be in this sector. In July 2007, Rwanda notified the WTO of its intention to use the waiver, to import 16 million ARVs, subject to three patents at the time in Canada. Within 2 weeks of receiving the actual application for the compulsory licence in Canada, the Commissioner of Patents issued the licence, said Foster. Under its Access to Medicines Regime (CAMR), Canada was one of the first countries to accept the waiver and the first ever to notify the WTO in 2007 of its intention to implement the law to authorise a company to make a generic version of a patented medicine for export. This marked the initiation of paragraph 6. Following that, generic manufacturer Apotex won the tender opened by Rwanda, and final shipments of the ARVs were made in 2008 and 2009. The actual length of time for the use and operation of paragraph 6 system amounted to a maximum of 3 months, according to Kampf. Hu emphasised that “the mandate of the Doha Declaration to the TRIPS Council is to find an ‘expeditious’ solution to the problem facing the member states,” and that it is questionable whether paragraph 6 has met that mandate. 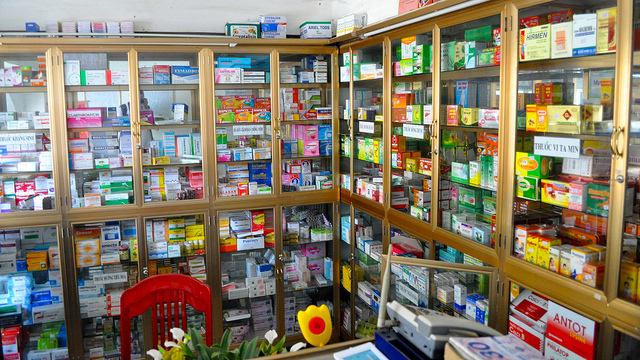 The Canada Rwanda case also illustrated the “interplay between trying to use the system and the generic entry into the market which actually provided a much quicker and easier solution for a country to choose the generic producer through the WHO prequalification without any conditions attached” enabling purchase of the product from the qualified source, said Hu. According to Broun, it took 4 years to complete the process of Apotex’s delivery of drugs to Rwanda, though acknowledging that part of this time does not include the working of paragraph 6. In financial terms, Apotex lost US$ 3-4 million dollars by offering a lower price to win the tender, said Broun and that “in such a small market, this is definitely a very big problem.” Broun also noted that the amount of drugs supplied in the 2 years was lower than the amount Cipla produces per month. Overall, Broun found paragraph 6 to be a cumbersome and ineffective process and that Cipla will not use para 6 in its current state of writing. Furthermore, following up from Hu on referring to the excessive pressure of industry and certain countries, Broun highlighted the fact that the Indian government is very reluctant to issue a compulsory licence even for its own population’s health needs. This is due to the threat of retaliation by the US government and threats of action under Special 301, an annual report on other countries’ protection of US intellectual property. In turn, “there is very little incentive for the government of India to go out of their way to face these threats on behalf of another country” and “the likelihood that India would grant a licence at the request of a non-producing country is very small,” said Broun. Moreover, Broun urged developing countries in Africa and elsewhere not to “self-impose” TRIPS-plus measures undermining their ability to use TRIPS flexibilities such as compulsory licensing, and also to set up domestic production of pharmaceuticals. “Low income countries with no [drug manufacturing] capacity should be able to buy from other LDCs with capacity,” such as Uganda and Bangladesh, he said. Cipla work with Uganda has led to it producing WHO-approved products, he added. In the field of HIV, the paragraph 6 system is no longer necessary, as there are other options and there exist funding organisations as well as a large number of voluntary licensing agreements which allow the availability of these HIV medicines, said Broun. Meanwhile, Guilherme Cintra, senior manager for Innovation, Intellectual Property and Trade at the International Federation of Pharmaceutical Manufacturers & Associations (IFPMA), advanced a set of 13 questions he created to demonstrate the necessary conditions for it to make sense for a country to invoke paragraph 6. Going through the list, Cintra said that one would have to answer “No” 5 times and “Yes” 8 times in order to arrive at the paragraph 6 option. The “No” questions include asking whether the medicine was already available elsewhere, either in another jurisdiction, through an international funding mechanism such as the Global Alliance for Vaccines and Immunisation (GAVI) or the Global Fund, through voluntary licences or tiered pricing for example. The “Yes” questions ask for example whether the medicine sought is a priority; has gained market approval; whether supply can be sustainable and is compatible with the market, and if costs can be covered by the country’s policy priorities and health care system. If all questions are answered accordingly, Cintra believes that there is a very narrow case whereupon it makes sense to use the paragraph 6 system. Suerie Moon, director of research of the Global Health Centre at Graduate Institute of International and Development Studies in Geneva, said the WTO amendment to TRIPS was made on account of global health. This is a hugely encouraging development, but would be even better if the system delivered, she said. Moon said that the paragraph 6 system is cumbersome and not economically workable for generics companies, and therefore needed to be renegotiated. The world has changed a lot since 2003 and 1995, when TRIPS came into force and priorities on the agenda are now changing and growing, such the Ebola and Zika outbreaks and the rise of non-communicable diseases, outlined Moon. Moon commended the CAMR and the political will of the Canadian government, however put forward that “the idea of restricting the [paragraph 6] system to a list of medicines when public health needs are rapidly and constantly evolving” presents an example of “TRIPS-plus-plus”. Referring back to the IFPMA’s list of questions, Moon was of the view that this would lead to further restrictions on the use of compulsory licensing, rather than making it a tool which governments can actually use to resolve public health issues. Two-thirds of WTO members need to accept this protocol by formally ratifying it. Yet with new entries to the WTO, this is a moving target, said Kampf. The deadline for acceptances has been now set at the end of 2017. At present, a handful [corrected] more acceptances by WTO members are required. Moon suggested that before paragraph 6 becomes a permanent amendment, it is important have a “good hard look at the system” and whether it serves its intended purposes. It is unclear whether member states will take up this suggestion and reopen the issue. Beyer contended that the problems of HIV and hepatitis C drugs were being addressed in other ways, and encouraged on-the-ground studies on countries with no manufacturing capacities and for which drugs the system could be used. 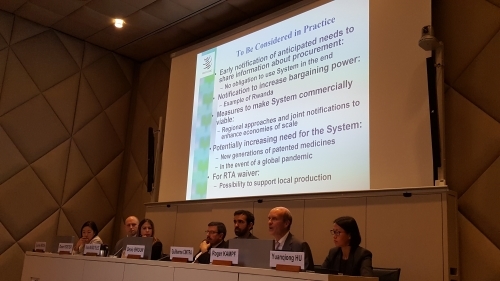 "WTO ‘Paragraph 6’ System For Affordable Medicine: Time For Change?" by Intellectual Property Watch is licensed under a Creative Commons Attribution-NonCommercial-ShareAlike 4.0 International License.